Matlaws Stuffed Clams are popular frozen baked stuffed clams that are available at many grocery stores at least in New England. 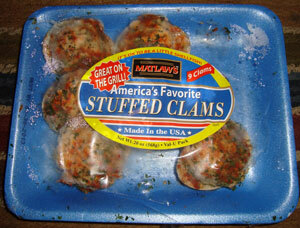 They claim to be "America's Favorite Stuffed Clams" on the label. I do like how they say, "It's Ok to be a Little Shellfish" on the top of the label. They appear to be in a large cherrystone shell or perhaps a small ocean quahog, and are 100 calories each with 4 grams of fat, 10 grams of carbs including 1 gram of sugars and 5 grams of protein. Each shell contains 0.9 ounces of filling, and they claim "New and Improved." A product of the USA, they are distributed by National Fish and Seafood, Inc. of Gloucester Mass. Before we get to the taste and ingredients, National Fish and Seafood describes them on their Web site as "stuffing mix is a blend of Italian bread crumbs, clam meat, red and green peppers with	celery and choice spices"
I microwaved a couple - 4 minutes for 2 clams. Tasty, but a bit mushy, no doubt from the microwaving. I also baked a few, 30 minutes at 450 degrees. Much better indeed, with a crunchy and slightly crispy top and tender insides. 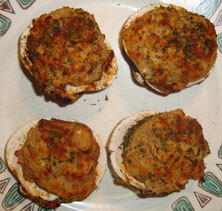 They are pretty good, not as good as a great fresh baked stuffed clam, but surprisingly good. They say great on the grill, but I've only tried them microwaved and baked so far. Ingredients in order are water, bread crumbs, water (yes, they list it twice), yeast, partially hydrogenated soybean oil, oil, salt, and a long list of "less than 2% ingredients" including clam meat and textured soy protein. I liked them better before I read the label, but they do have good clam flavor. Having eaten plenty of textured soy protein, especially at a vegetarian dim sum place in Hong Kong where most dishes looked, tasted, and felt like meat, I'm sure some of what I perceive to be clam is not. Still, Matlaws Stuffed Clams are pretty good. And now I'll need to add experiments with baked stuffed clams to my list of things to do, to get the ultimate baked stuffed clams.